Like any art form, jazz can be "understood" on many levels, from pure enjoyment of the melody and rhythm to a deep understanding of chord progressions and improvisational theory. Hard to appreciate? Hard to love? Any harder than acid rock, hip hop or modern classical experiments? Appreciation and love naturally are not universal reactions to jazz any more than to Impressionist paintings or opera or Mozart or eggplant. Each to her own taste. But clearly jazz appreciation—or at least recognition that jazz has a local audience--is hard for someone who apparently has taken no time at all to look around and see just how much jazz is available in the Twin Cities, perhaps more per capita than in any city in the US. Hard to find? Check the Friday Strib, Jazz Police at http://www.jazzpolice.com/, Pamela Espeland’s weekly column at http://www.minnpost.com/, the Twin Cities Jazz Society site at http://www.tcjs.org/, or Maryann Sullivan’s weekly “Jazz Connections” via MPR. Just don't check MPR’s own Minnesota Monthly! 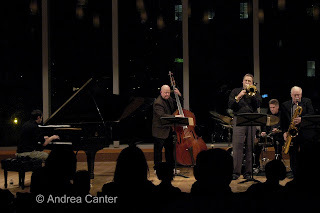 Recently on Jazz Police I posted an overview of where one can find free and cheap jazz in the Twin Cities area (see http://www.jazzpolice.com/content/view/7667/115/). Seems that every day I learn about or recall a venue I left out, and I will update the listing periodically. Jazz isn’t limited to downtown clubs, although the Dakota and Artists Quarter are certainly the best known venues in the Metro. But to declare that there are few options beyond the Dakota or AQ is like complaining that there are few jazz venues in Greenwich Village beyond the Vanguard or Blue Note. Take away our two very centrally located jazz clubs and what’s left? In and near downtown Minneapolis, we have Rossi’s (jazz a few nights per week), The Times (jazz seven nights per week), Babalu (Latin jazz), the new Rosewood Room in the warehouse district, and that’s just clubs. Downtown and nearby Minneapolis also boasts Orchestra Hall with its new high profile jazz series (Delfeayo Marsalis and an amazing cast tonight, Dianne Reeves on May 2nd, the great Dave Brubeck Quartet on May 25th, the Downbeat stars on June 26th, Terence Blanchard and his “jazz at the movies” show on August 1st); the Walker Art Center presents modern and world jazz throughout the year (Bill Frisell, Craig Taborn, Drew Gress, Dave Torn have been on stage recently); the U of M presents a half dozen major acts via the Northrop Jazz series each year (Ramsey Lewis, Ravi Coltrane, and Roy Haynes were on this season’s agenda); the new and amazingly hip and beautiful MacPhail Center for Music, now in the Mill District, holds a Jazz Thursdays series highlighting local talent and in March hosted the Twin Cities Winter Jazz Festival with headliner Sonny Fortune. And, perhaps oddly, the Minnesota Opera Center in the warehouse district is the new performance home for the Jazz Is Now! ensemble. Move across the river, and not only will you find the musician-friendliest club at the Artists Quarter in the Hamm Building but such small venues as the Black Dog Bar and Hat Trick Lounge, serving jazz on a regular basis. Fan out toward Midway and find at-least-weekly jazz at the Clown Lounge. But so many more venues spring up in the neighborhoods and out in the burbs, it’s hard to keep up. In the past year we’ve seen live jazz presented at least weekly at Café Maude and Cave Vin in southwest Minneapolis; at Crave in the Galleria (Edina), Sage Wine Bar (Mendota), the Dakota County Steakhouse (Burnsville) and other spots far from the din of downtown. Live jazz is available seven nights per week at multiple venues to anyone with open eyes and ears. And really, is jazz just “too damn hard?” Tonight there were few empty seats at Orchestra Hall, and I doubt that two-thirds of the audience qualified as hard-core jazz aficionados. And no one seemed to find the music too difficult to applaud with enthusiasm or stand and clap in time with minimal encouragement from Delfeayo Marsalis or Kermit Ruffins as they presented the sounds of New Orleans and Louis Armstrong. Andrew Putz, get out of your office and unplug your ears. Even if you don’t understand this music, you can surely find it.